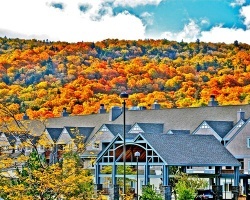 Killington's only mountainside hotel offers studios and suites with walk-to-the-slopes-and-links convenience! Each unit has a fully equipped kitchenette and entertainment unit. Amenities include a restaurant, lounge, convenience store, day-care facility, health club, sauna, steam room, outdoor heated pool with two hot tubs, and a complete menu of spa services. In the warmer months, enjoy 200 slopes at Killington and Pico mountains. Within an hour drive, you will find shops; live entertainment; on-and-off mountain, water, or snow activities; museums; and more than 100 restaurants and nightclubs. 4-seasons resort with fractional ownership of 13 weeks per year! Usage is every 3rd week per month! Mountain view unit in Red season! Make offer!